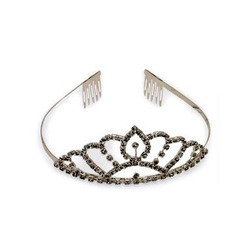 Our proficiency lies in designing Hair Crown Jewellery/ Tiara. We design this product keeping in mind prevailing market demands and industry laid norms. Keeping in mind the requirements and needs of the customers, we are involved in offering best quality of Head Ornaments. These Head Ornaments are available in the market in bulk at most reasonable rates. We also ensure to provide most suitable products to customers and satisfy them in all possible manners. Keeping track of latest market development, we are devotedly occupied in offering an extensive range of Women Golden Head Set Ornaments. Juda with pearls in a cluster and a blue stone on Silver.We are offering Juda in various designs. These Judas are look very beautiful to the wearer and most of the ladies as well as gilrs perfer this. We provide a wide range of juda for our clients in beautiful color combinations. Our range can be customized as per client’s requirement regarding its size, shapes and color combinations. These can be availed in industry leading prices. We are an accomplished organization which has gained name and fame in providing Head Ornaments to the customers. Moreover, we offer these power sprayers in various specifications. A light weighted design attached to a bob pin to increase the look of your costume a very fast selling product in the present market and the plating and stone color can all be selected by the customer. We are dealing exclusive fashion hair accesorrie. Here avliable many design. Beautiful Juda , studden with CZ and semi- precious stone. Pearl Pins with Diamante for Bridal and Wedding hair decorations. Hairpins can be plated with different finishes like Silver, Gold, Rhodium and as per nickel compliance norms. Owing to the presence of our expert team members, we are able to offer a wide range of Hair Crown. In order to meet excellent quality standards, we are supplying Acrylic Hair Ornament.